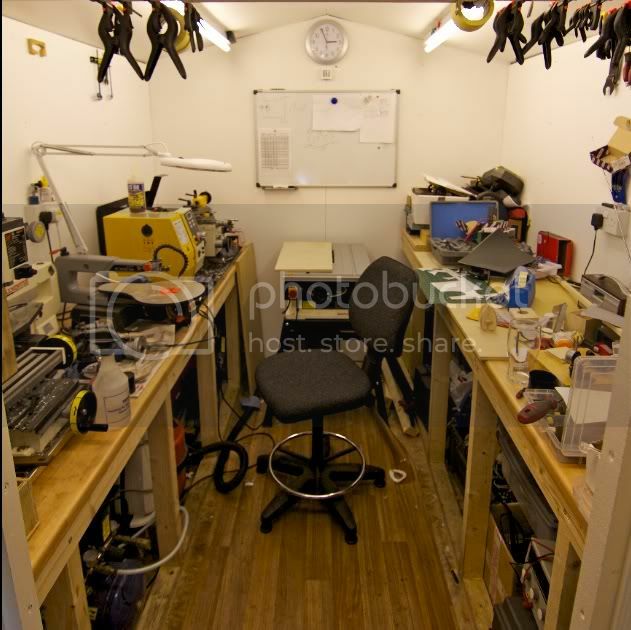 The purpose of the following is to promote a safe and knowledgeable start into Milling in the Home Workshop. It is not the “bee all and end all” by any means, just a start. It welcomes discussions. All you need is 5% knowledge (provided here) 5% skill you will have to provide that and 90% love, care and patience. No not being funny - really important. More so than speeds and feeds. A) The whole machine needs to be rigid, ideally bolted down –especially the bench types. B) When moving 1 axis the other 2 must be locked. All the axis should be adjusted for minimum play. When using the hand wheel a slight drag should be felt. C) The tool must be held in a rigid and proper manner, (a drill chuck is not good) and must remain such whilst rotating and cutting. A sloppy Z axis or quill will give a poor finish and can break your mills. D) The work piece must be held in a rigid manner, this does not mean tightening the clamps as tight as you can. It means use 4 clamps instead of 2. Always try to mill against the fixed jaw if using a vice. Slot Drill is only used to cut slots – that is what it is designed for. Always cut in the same direction. At the end of the slot length raise the tool traverse back to the start, lower the tool and cut again. Cutting backwards and forwards will only make the slot over size and produces a poor finish. Keep removing the chips. The maximum depth of cut is half the diameter of the slot mill D/2. This is a maximum, it is not what you have to make the depth of cut. On closed slots even though most slot mills are centre cutting, a hole drilled at the start can help to stop over sizing at the start. Hole size 50 – 80% of slot mill diameter. Use the table stops for consistency . End Mills are used for profiling – again that is what they are designed to do. Not facing using the end, although we all do it. The depth of cut is how far the side of the end mill goes into the work piece. The maximum depth of cut is ¼ of the diameter D/4, over a length D of the end Mill. For a 12 mm dia end mill on maximum cut will produce a step that is 12mm deep down into the work piece and 3mm deep (horizontal) into the work piece. A step 12mm deep 3mm wide. Again these are the maximums. It is best not to use end mills to cut a slot whose width dimension is the same as the nominal cutter diameter, the slot width will come out over size. The reason for this is the end mill has a minus zero tolerance on its diameter. So the end mill can be over size before you start. Cutting a slot with an End Mill. Nevertheless slots can be cut using an end mill. Let’s suppose a 12mm wide slot is required, first use an 8 or 10 mm slot drill cut the slot to the required depth and length. 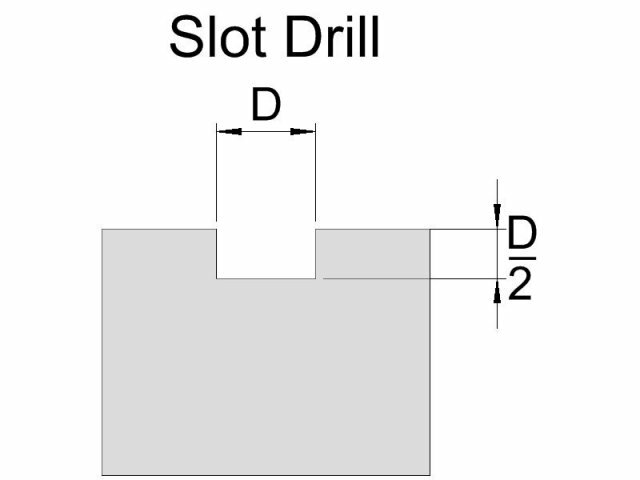 Replace the slot drill with an end mill equal to or less than the slot drill diameter. Put on a depth of cut (remember what the depth of cut is for an end mill it is how far the side of the end mill goes into the work piece) lets say 0.25mm (0.010”) move the tool down to the bottom of the slot then traverse the work piece to cut the inside of the slot face. When the end of the slot is reached the tool is raised clear of the slot traversed back add a depth of cut and repeat the procedure. In most cases it is preferable to take equal amounts off both sides of the slot. When cutting the slot faces it is important to use convention milling. 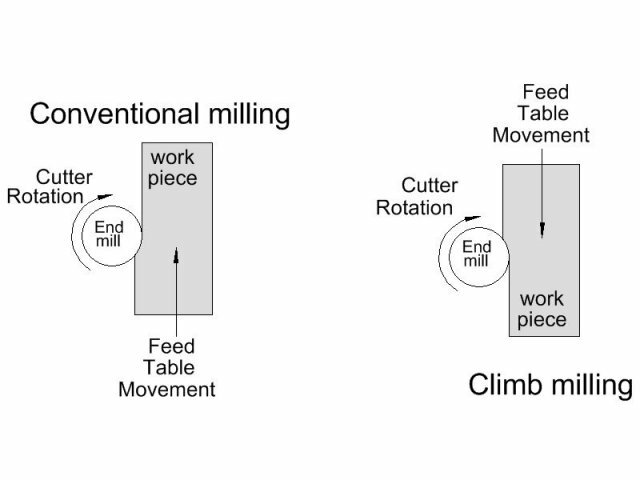 Conventional milling vs climb milling. This leads us on to conventional milling vs climb milling, in the Home Workshop conventional milling is nearly always the best option. Sometimes climb milling is unavoidable use small depths of cut 0.002” to .005’ if you use larger depths of cut something bad may happen! Side or edge facing can be done using an end mill, it’s best to choose the largest feasible end mill for your machine and 4 flutes or more. You can use the whole length of the cutting part of the end mill, just keep the depth of cut below ¼ mm (0.010”) . If the width of the material is ½ “ (12mm) and using a 16mm diameter end mill the depth of cut can be increased to ½ mm (0.020”). So for side or edge facing the depth of cut depends on the cuter diameter and how much of the cutting length is required. The more cutting length smaller the depth of cut. Finishing cuts. Allowing for one or two finishing cuts of 0.002 – 0.005” will always give a better finish. Roughing Mills are the best for large removal of material. Start with the same speeds and feeds for end mills the speed can be increased by 25% and depth of cut by 50%. Try to do the increases in small increments. Feel, listen to the machine. So far so good, now comes the tricky bit. All materials have optimum cutting parameters, which are used in Industry, on big heavy rigid machines, with sharp cutters and re-sharpened or new cutter every shift or ½ shift and flood coolant. So we cannot just use these Industry parameters, they are just not suitable for the Home Workshop Mill. However the data is still useful to us it gives us a good starting point. “Please sir my cutter keeps on breaking” Huh some people are just bloody clumsy! 4) Build up of chips. On the cutter, in the slot. Not just one of the above can break your mill but 2 or 3 or 4 or all 5 working together can, so there is a lot out to get you! They also give us the poor finishes. Now the bit you are all waiting for how fast must my ½” (12mm) end mill go? Well disappointing not fast – more like how slow. Compared to what is used in Industry. Let’s look at the data. Feed. This is a measure of how far the table travels per tooth of the cutter, eg. Feed is .003”per tooth for mild steel, so on a 4 tooth cutter the table can move 4 x .003” = .012” per revolution of the cutter; because each tooth will cut .003”. Cutting speed. This tells you how fast the cutter can go (RPM) the type of cutter (HSS / Carbide) and the work piece material determine it. The cutting speed is given in feet per minute (or Metres per minute). So for steel and HSS end mill this is 150 to 200 ft/min. To get the spindle speed all we have to do is divide the cutter’s circumference into the cutting speed. The distance around the ½’ cutter is = Pi x Dia.= the circumference. But (and there is always a but) everything needs to be in inches (or mm in metric). We will take 200 x12 makes it inches and we divide the circumference of the cutter into it. Thus (200 x 12) / (3.142 x 0.5) = approx 1500 RPM ( in your dreams) half it 750 RPM. Now you have the speed of the ½” cutter 750RPM (fair whizzing eh!) A bit disappointed! It’s fast enough to start with. All we need now is how fast can we move (travel) the table – more slow than fast. We have from the Feed .012” per revolution, so 750 revolutions per min x .012” = 9” per minute. Too quick for us so half it. Here it is then - ½” 4 flute HSS cutter @ 750rpm and a feed rate (table movement) of 4.5” per min. Nearly finished! -Still with it. This is all at the maximum depth of cut of 1/8” (D/4.) Until you get to know your machine and the material you are cutting lets start with 1/32” depth of cut. Listen to the machine – feel the vibrations. The machine will let you know if it does not like it. If all seems well, increase the depth of cut – keep clearing the chips away, try increasing the feed rate not too much listen and feel the machine. Be careful not to just increase the speed RPM because the cutter will get too hot. If on the other hand it feels bad, (vibrations) noisy and jerky then your best bet is to reduce the speed, to 350 – 400rmp, start with a small depth of cut 0.020” (0.5mm) and a slow feed 2” per min. You can always build it up. One of the worst things you can do is run the cutter too fast with little or no depth of cut. It will just over heat the cutter and blunt it. The cutter must always cut never rub – rubbing will blunt the cutter in no time. Below are some speeds and feeds. These are not written in stone it is just a place to start. Start with a ½ “ (12mm) cutter, if you have a smaller bench top machine start with a ¼” (6mm). Cut some steel, aluminium use a small depth of cut, notice the difference. Try different speeds with same depth of cut, if you hear a squeal noise from the cutter it is too fast – don’t go too fast you will just blunt your cutter. Your machine will like a particular speed and feed for a given cutter diameter and material, that’s it not much you can do about it. Your machine is happy so you should. Try a finishing cut 0.003” see what happens by increasing the feed rate a bit, or slow it down. May be you are only doing finishing cuts that’s great you are “Milling”. * High feed rates with small cutters can easily break your cutter. Low feed rates with large cutters although tend not to break your cutter can damage your work piece. Reduce the depth of cut. You can see where we are just start slow and easy. Don’t rush it go slow, small cuts, feel the machine, listen to it, you will soon know what is good for your machine and what is not. Write your speeds down along with the depths of cut and the feed rate. Fast, medium slow is good enough, just so you know the next time where to start. Remember the chips come off fast and hot; be careful – try to preserve your one good eye! So why does industry like the carbide end mills so much. You said it is the material that defines the cut not the cutter. I did and it does, a carbide end mill Feed is still .003”per tooth same as the HSS but the carbide can go 2 to 3 time faster, therefore the feed rate (table speed) is 2 to 3 times quicker. Job done in 1/2 to1/3 rd of the time. Industry loves doing it quick. But sadly not for you or me our machines are just not rigid enough for those sorts of speeds and feed rates. Nevertheless there are some benefits for us, they will stay sharper longer than a HSS and we can run 50% faster and thus increase the feed rate by 25% to 50% . or just run them at the same speed, feed rate and depth of cut as HSS cutters and they will last a lot longer. Another way to use carbide mills is to increase the speed by 50%, leave the feed rate and decrease the depth of cut to .005” to improve the quality of the finish. A finishing cut. Carbide end mills and slot drills do no like shocks, thermal or mechanical. So it is best not to use intermittent coolants or cutting fluids, opinion seems to not using any at all. Slot drills and end mills below 3mm are another story. Facing is also another story to be dealt with later. Summing Up Conventional milling the Speeds and Feeds Table shows maximum depths of cut at maximum feed rates. Always start at a lower depth of cut and feed rate. Listen and feel the machine it will tell you what it doesn’t like. Hand cranking at the correct feed rate is near impossible, but you have the added advantage of feedback, feel it if it is “jerky” reduce the depth of cut, and if necessary slow the feed rate. Ask some who has been milling a number years regularly, what speed and feed he uses I guarantee he/she will not know. Further more you don’t need to know, these speeds and feeds are to get you going just a start, in no time you will get the hang of it. Milling is a slow process be patient you will reap the rewards. This thread needs a sticky!! I ought to know this, but have forgotten it (30 years since I had to do this kind of math....). I've been looking for this!!! Thank you, Dave. Will be sharing with my little group in Singapore. Some of us have been trying different combinations till we snapped the cutter. That was a very well written post. I think some of it may have sunk in . You re-assured me in my more or less intuitive approach to speeds and feeds. If it sounds right and it looks right it probably is right! I'll add a useful sanity clause - a Horsepower at the spindle can in ideal conditions; remove one cubic inch of steel or up to three of aluminium per minute, so one can multiply out width and depth of cut and feed rate to get a HP requirement and compare it to motor power, determining whether you have enough oomph for the cut - if you find the cut would take 2HP and you have a 1/2 HP motor power reaching the spindle after losses in belt/gears reduce the depth of cut to suit, not the feed rate, too slow a feed will cause the cutter to rub, overheating the cutting edges - the tool won't break but it will blunt pretty quickly! Rules are for the obedience of fools, and the guidance of wise men. Good point: reduce the depth of cut - not the feed rate. Another thank you from me to..saved on hdd and also printed for workshop draw. An informative post for milling machine owners, well done. Your post helped me get rid of the "too slow spindle speed" syndrome. Since upping the speed while using an appropriate feed rate as indicated by you, mild steel melts like butter on my little machine. Just searched and came across this post. A great post and reassuring as I created my first chips om my mill yesterday. I notice that doing a plunge cut with a slot mill, 10mm into 8mm mild steel plate my machine vibrated a lot. Essentially I was drilling a 10mm hole. I've since decided that holes need to be drilled using a drill! But it was a good trial and error practice. I ended up guessing at 700rpm for spindle speed when cutting a slot, and taking no more that 0.5mm depth of cut, so not too far out, I shall bookmark this thread for future reference.